Last year, after losing one of the most epic battles between my rational self and my friend Telisa who suggested we run the Walt Disney World Goofy Race and a Half Challenge, I crossed the finish line of the Mickey Marathon at Epcot Center, immediately burst into joyful tears of disbelief while hunched over and successfully convincing a volunteer medic that I was about to have a coronary, and was then crowned with two beautiful medals that clanked together with joyful annoyance every step I hobbled. I had started out that race without any idea how it was going to end. Waking up at 2AM was BRUTAL and honestly, the thought of laying in bed for a little bit more sleep was almost more appealing than the thought of earning two medals that were prettier than the one I had earned only 24 hours earlier. Telisa and I barely spoke that morning because we were so exhausted, and starting the race, I caught myself wondering if this was the beginning of the last marathon I would ever run. I just didn’t know what was going to happen in between the 26.2 miles that lay ahead of me. Hearing the song “Go the Distance” from the Disney movie “Hercules” as just what I needed to feel like I was about to conquer something amazing if I had the guts to go after it. 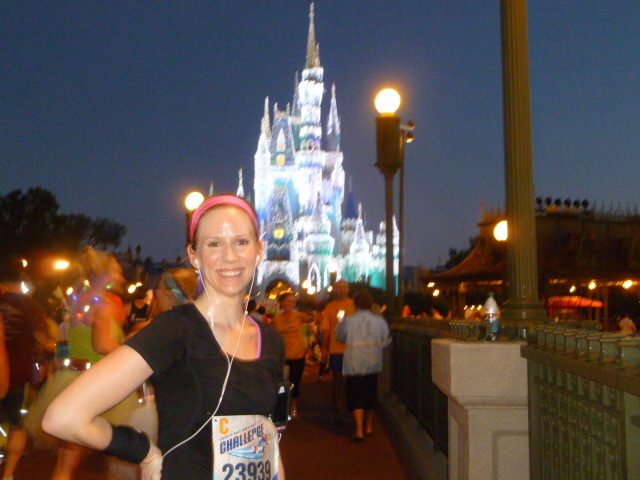 As it turns out, that race was one of the most fun marathons I have done (ya know, of the four I have done!) Having Telisa there to run with me made the journey feel much more possible and fun than if I had run it alone. We stopped when we needed to stop, paused for pictures here and there, and talked about our planned victory dinner that night, our experiences with races we had run or were planning to run, and how we had trained for this race. I can still remember major points of the marathon– at the first mile, the guy who ran along the line of port-a-johns yelling, “Come on, come on, let’s goooo!” and how everyone around us laughed, stopping for pictures at Cinderella’s Castle around mile 6 and thinking “only 20 miles to go,” the bottleneck at mile 7-9 where I overheard Marlin and Dory costumed-runners breathlessly singing to each other, “Just keeping swimming,” saying my blessings to runners with charity t-shirts on, learning that eating bananas mid-run made me sick, ignoring the abandoned theme rides that were mysteriously parked along the back routes of the four Disney parks, pit-stopping at mile 15 after exiting the Animal Kingdom and realizing that the Florida sun was no joke, practically slithering our away through said searing Florida sun as it baked a 2-mile stretch of Interstate when I decided that it would take a heat coma for me to not finish this race, frequent pauses for Biofreeze on my quivering IT bands, the blessed team of volunteers who passed out ice-cold bursting sponges that Telisa and I used to soak every last millimeter of our exhausted, overheated bodies as we kept running through the Wide World of Sports, the pineapple Gu I sucked down at mile 20 and answering breathless runners passing us at their mile 18 when they asked what mile we were at to gauge where they were, my iPhone battery dying at mile 23, stopping for more BioFreeze at mile 23 and not remembering anything at all about the previous 3 miles, how the cheering crowds lifted my spirit at mile 24, the overwhelming need to be done when we reached mile 25 and I decided to charge ahead of Telisa but stopped because I wanted to finish with my friend more than I wanted a faster end to the race, the choir singing at mile 26 and bursting into tears but immediately pulling myself together so I could cheese it up for the neon-vested photographers that peppered the last hundredth of a mile before the finish line, turning the corner to see the finish line right in front of us and saying to Telisa, “See that? That’s all we have left to go! Let’s put this race to bed!” and hearing her say, “Okay,” just as I felt a stitch under my sternum pierce its way into my lungs and making me lose my breath but ignoring it as I pushed faster and how it only made the stitch worse, but suddenly I gave Mickey Mouse a high-five and then I was done. Okay, that was a lot of memories, but clearly Disney got something right if a year later, I can still recall all of that. 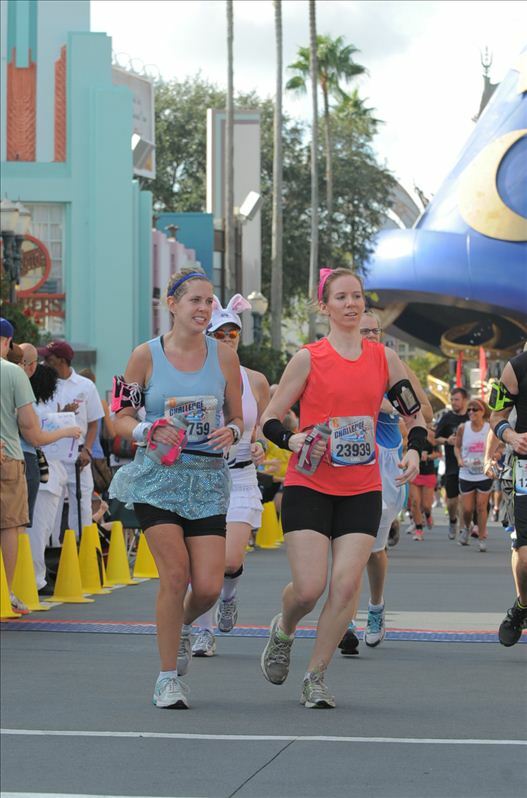 For the past several days, I have followed so many runners on Twitter and Instagram as they post pictures and thoughts about their experience at the 2014 Walt Disney World Marathon Weekend. It’s been hard to see, knowing how much fun I had and how accomplished I felt after I crossed that finish line last year, but I honestly and truly felt happy and excited for all of them, too. Some people apart from the running community might call it weird that I was obsessively refreshing my media feeds to see glimpses of fellow runners’ experiences, but that’s one of the things I love most about the running community: we all know what we’re all going through and we can all cheer each other on because of it. The running community is SUCH an incredible, supportive, and welcoming group of people and I have “met” so many inspiring people who push me along in my own journey as I follow their training and running life on their blogs and social media feeds. They almost feel like my friends, even though I have never met any or have briefly run into a couple of them as I am running. And I look forward to running races because of the people who are running them right along side of me. So, as a final nod to the amazing people who got up at 2AM for one, two, three, or four days in a row, who battled the intense Florida heat and humidity, who wondered the same thoughts about just how the hell they were going to make it through the miles that challenged them whether it was for the first or the fiftieth time, and whose arms silenced the joyful clanking of their medals with a calm, assured, and happy smile, from the bottom of my heart and as a fellow WDWMarathon alumna, congratulations on an amazing journey, and thank you for letting me follow your journey from my couch where I sat proudly wearing my 2013 Mickey Marathon race shirt.